Some see a sloped yard as a drawback, while others see it as an asset. The difference between the two is having a workable design that makes the sloped area usable and capitalizes on the dramatic potential of a hillside lot. Multilevel landscape design utilizes retaining walls, terraces, steps, decks, and other features to create accessible planting beds and areas for outdoor recreation in hilly terrain. These are fairly complex, costly features that often require expert assistance to execute, but before you hire a professional it's helpful to get an idea of what's possible. 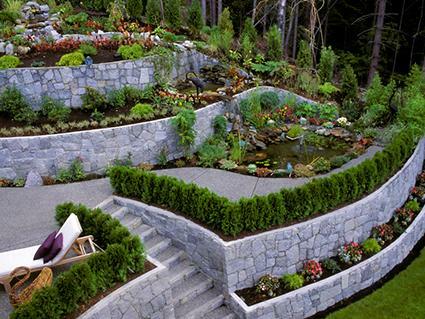 Retaining walls allow you to reduce the angle of a slope so it is easier to plant, walk on or use for other purposes. They are typically made by 'cutting and filling'-- excavating a portion of the slope and using the soil to backfill behind the retaining wall to build a relatively flat area. One retaining wall may be enough to support a short stretch of slope, but a series of parallel retaining walls is often used to support a large slope. In general, the taller the retaining walls are and the closer they are together, the flatter the slope is above them. 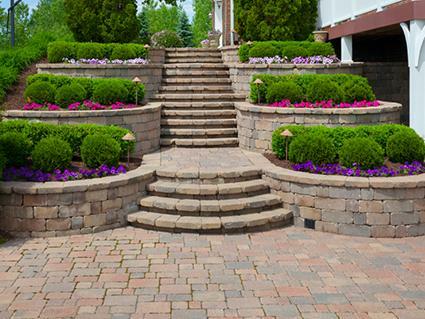 Terraces are created when a retaining wall is tall enough to create a level surface above it. Terraces are necessary for pathways, lawns, patios, vegetable gardens and other areas where people need to move around comfortably. But if the goal is only to plant the landscape with ornamentals, the retaining walls can be shorter -- most groundcovers will thrive on slopes as steep 45 degrees, but getting the slope down to about 20 degrees opens up more possibilities for landscaping. 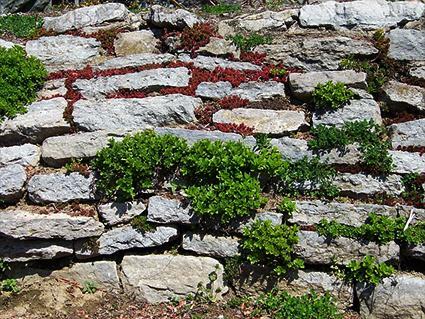 Retaining walls may be built with natural stone, concrete blocks, railroad ties and a variety of other materials. Choose a material that matches the look of your house and fits with the overall style of your landscape. Sticking with the same material for all the walls and stairs is a wise choice because it gives cohesiveness to the overall design. Retaining walls over three feet tall generally require a building permit and should be built by a professional contractor. Retaining walls of any size need to be built on compacted subsoil to prevent them from settling over time and need a perforated drain pipe and a layer of drainage gravel behind them so water can flow away rather than build up behind the wall. Walls may be constructed with a perfectly vertical profile or angled slightly into the hill which reduces the complexity of building them. Often, multilevel landscape design includes a combination of retaining walls of varying heights, flat terraces, moderately sloped areas, and other features that are knitted together with a network of walking paths and stairways. For a grand, formal look, route the stairs straight up the middle of a series of retaining walls. Alternatively, break up the landscape by using the stairs to go from one terrace to the next in different areas, using pathways along the terraces to connect them. Wherever access by foot is not needed, it's fine to leave the slope steeper (no more than 45 degrees) and use those areas just for planting. You can make planting shelves, like mini-terraces, to create a focal point, as well as flat ground to plant on, for individual trees on areas of steep slopes. On the flatter areas, build small beds and fill them with rich topsoil for flowers or vegetables and herbs, if desired. There are an infinite number of possible configurations, but the best approach is to use a single material for all walls, stairs and beds and weave them together into a single design. There are other ways to create flat, usable space on a slope that you may want to consider. The following elements can be integrated with terraces and retaining walls or used independently. Because they are all freestanding structures, they can also be used to create multi-level interest in flat yards. Building a large terrace allows you to build a patio for outdoor gathering, but you can often get more space with a deck. Because they are made of wood and elevated off the ground, decks also have a very different feel than a terrace and can be used to make a multi-level design even more dynamic. Decks have significant engineering requirements for safety reasons, so they should only be attempted by skilled carpenters or landscape professionals. 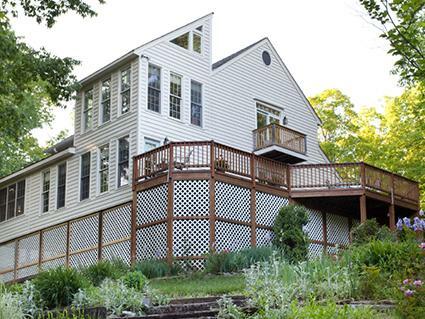 In terms of design, decks are typically built near the top of a sloped area to enjoy the view. Decks and trellises often go hand in hand. The exposed underside of a deck on the downhill slope can be concealed with lattice work planted with vines. Trellises are also useful around the sides of a deck as a visual screen. In any way you choose to integrate them, trellises are yet another way to add vertical levels to the design. Living walls can be integrated with retaining walls, attached to the exterior of the home or erected as free-standing structures. They are specially designed structures that provide a growing medium for plants (often succulents) and have a built-in irrigation system. Unlike other vertical structures, they appear as a living wall of vegetation rather than a hard surface. A boardwalk is an elevated wooden pathway that is built in the same way as a deck. They are easily integrated with wooden stairs and deck areas and are a viable alternative to ground level terrace and stair systems for getting around on a steep slope. No landscape is complete without plants, but there are special considerations when it comes to multilevel landscapes. Stick with small flowering trees rather than large shade trees. The root systems can destabilize retaining walls and deck footings. Small shrubs are useful as borders/hedges and can be placed following the lines of terraces and other hardscape features. Maximize the use of vines and cascading groundcovers to soften the appearance of the structural elements of the landscape. 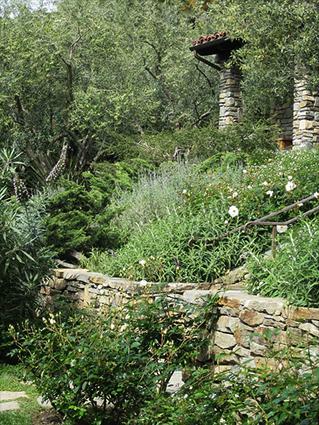 Trailing plants, like prostrate rosemary, look great when cascading over a retaining wall for example. Small plants can often be tucked into the soil in crevices within dry stacked stone walls such as wallflowers. South-facing slopes are extremely hot and dry, so use plants that are adapted to those conditions like succulents. North-facing slopes are cool and shady, so make sure to use shade tolerant plants like ferns. In areas with more than a 20 degree slope, use groundcovers to help hold the soil in place. Erosion control fabric is useful for getting plants established on slopes. Multi-level landscapes in front yards are usually much simpler and streamlined compared to a backyard context. Gathering areas are generally not included in front yards and as long as there is good access to the front door from the driveway, you may not want to bother with a path through the sloped part of the landscape in a front yard. In a front yard context, simplicity and symmetry are important for the sake of curb appeal. Often, a simple design with a series of parallel retaining walls is sufficient. Plant these with a combination of small flowering trees and low-growing groundcovers for a low maintenance, good-looking multilevel landscape in the front yard. Multilevel landscapes have more safety considerations than flat landscapes. Besides the engineering requirements to ensure that things like retaining walls and decks are structurally sound, measures to prevent people from falling are also necessary -- namely, railings. It's a good idea to have a hand-height railing anywhere that a pathway or other areas that are accessible to people have more than a 2-foot drop-off, whether it's the edge of a deck or the edge of a terrace. Any accessible drop-off more than 12 inches tall should have a short railing or border of some sort at ground level to prevent people from stepping off of it accidentally. Nighttime lighting is another crucial safety consideration for all stairways and drop-off areas. There is something timeless about terraced gardens and other multilevel landscapes. From the grape terraces of Italy to the rice padis of Indonesia to the hanging gardens of Babylon, the idea has captured the human imagination for millennia.